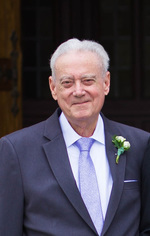 George Sanders Obituary - Mays Landing, New Jersey | Boakes Funeral Home, Inc.
George E. Sanders, age 86, of Mays Landing, NJ, passed peacefully to Heaven to meet the Lord and his family on Friday morning, March 8th, 2019. George was born and raised in Astoria, Queens, NY before moving to Haddon Township, NJ with his wife and family. George served his country in the Air Force and worked in the Pentagon during the Korean War. As a young man, George worked as an usher at Radio City Music Hall. He would go on to spend the majority of his career at IBM, as a manager, where he would retire from after 35 years of work. George was a loving husband and an amazing father and devoted his life to helping his wife and son. He is survived by his loving wife of 43 years, Kathleen Sanders, Steve Sanders his son and Lauren Sanders his daughter in law.